But Spracklen’s study suggests both the climate model projections and the observations may be correct. Deforestation can reduce rainfall over a wide region, even as it spurs increased rainfall in the immediate area where that deforestation took place. The analysis has “beautifully reconciled the scale of observations with that of models,” Luiz Aragao, an expert in tropical forests at the University of Exeter, said in a commentary published alongside the new study. The study authors’ “cutting-edge methodology will allow observations to be used consistently to examine large-scale deforestation impacts on rainfall, and to refine and evaluate current models to support conservation planning in the tropics,” Aragao wrote. 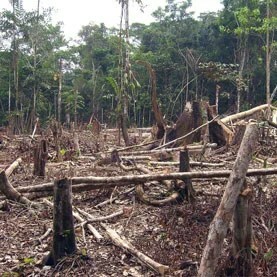 The scientists’ computer modeling suggests that if deforestation in the Amazon continues at the current pace, it could significantly cut rainfall hundreds of miles away over the next several decades. “The Amazon forest is affecting regions hundreds to thousands of kilometers away,” Spracklen said — distances that amount to hundreds of miles. Deforestation in the Amazon could sharply reduce rainfall in nonforested parts of southern Brazil, a rich agricultural area, as well as Paraguay and Uruguay, his study suggests. And a similar scenario appears to be at play in Africa’s Congo Basin. “If Brazil maintains its rainforest, it’s not just helping the [Brazilian] state of Amazonas,” Spracklen said. the plan is to destroy this planet. by making it impossible to grow food, destroying the oceans, and the air supply and poisoning everything, don’t believe it, just look around you. As the Amazon rainforest disappears, rainfall falters over a much wider area………..
And that is News why? My goodness we learned about moisture and rainfall in Junior school over 60 years ago. Our entire global ECO-SYSTEM is based upon GIVE and YE SHALL RECEIVE. Greenery gives off moisture into the Atmosphere and releases moisture, in the form of precipitation, back to the source from whence it came, the eternal circle/cycle and ultimate most logical “ECHO” System.